An abysmal 2% of respondents in a recent survey of young people said they had complete trust in the Northern Ireland Assembly. This is born from a well deserved cynicism towards parties which have failed to deliver a “peace dividend” for working-class people. Instead, while in power, they implemented an austerity programme which decimated our public services and wreaked havoc on the lives of working-class people. Many fear that the lack of a local government will only add to this downward spiral. Workers are told they must wait for a functioning executive to be restored before pay increases can be negotiated, women and LGBTQ+ people are told they must wait for a local assembly to grant abortion rights and marriage equality. The main catalyst for Stormont’s collapse was the unfolding Renewable Heat Incentive (RHI) scandal, which the DUP were at the centre of. Sinn Féin were initially reluctant to fight the DUP on this issue. In December 2016, they abstained on a motion in the Assembly calling for Foster’s resignation and had been nervous about calling for an independent, public inquiry, fearing it would undermine the cosy relationship which had developed between the parties. It was only pressure from the public and their base which forced Sinn Féin to take a harder position, with Martin McGuinness resigning as Deputy First Minister and triggering the collapse of the Executive. The Stormont Executive has not been functioning for over two years. 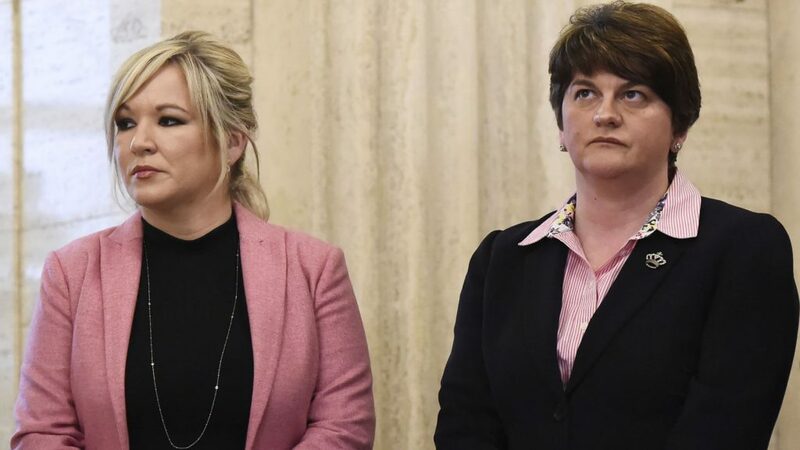 Quickly, however, both parties sought to shift focus away from the RHI scandal and, instead, to polarise the debate in society along sectarian lines in order to shore up their base. It is this dynamic that prevents an agreement for restoration being reached. Having whipped up feelings around issues like an Irish Language Act, to compromise at this point would be to undermine themselves in the eyes of their own support base. Sinn Féin promised they would “put manners” on the DUP, that there would be “no return to the status quo”. However, this was precisely what they were prepared to accept. The draft deal leaked in May 2018 suggested the two main parties were close to agreement – with Sinn Féin dropping ‘red lines’ such as progress on marriage equality – but it was scuppered as the DUP leadership felt they could not sell a deal including an Irish Language Act to their rank and file. Both the DUP and Sinn Fein agreed when in came to attacks on our public sector, including the Bengoa report which has been described as a “blueprint for privatisation” of our health service. The protests that broke out in towns across Northern Ireland under the banner #wedeservebetter were an expression of the frustration that many feel at the ongoing stalemate. While well intentioned and understandable, the demand to get the parties back into government has serious limitations. Ultimately, the coming back together of the sectarian parties at the top, a return to business as usual, would prove of little use to ordinary people. They fundamentally base themselves upon the politics of sectarian division and rely on that division being cemented in society. They are united only in their acceptance of austerity and neo-liberalism. What is needed is the building of a new party – a cross-community party of the working-class. In recent years, the trade union movement has given glimpses of the power of working-class people when exercised in an organised and independent way. The massive public sector strikes against Tory and Stormont austerity had the parties running for the hills. The union movement can, as the mass organisation which unites Protestant and Catholic workers, show the way forward to building a political alternative that can speak for the interests of the whole working class. Such a force must be armed with a socialist programme that challenges the rotten inequality of this system, takes up the oppression of women and LGBTQ+ people and points the way to finding solutions to the issues which continue to divide our communities.